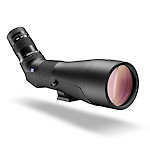 Zeiss Diascope Spotting Scopes newly developed top-class spotting scopes are offered in the Diascope 65 T* FL and Diascope 85 T* FL models - all provided with Carl Zeiss T* multilayer coating on all glass-to-air surfaces for maximum transmission and natural color rendition. Carl Zeiss is a name that embodies the finest optical instrument you can find. 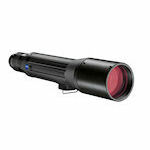 3-stage wide angle zoom spotting scopes with premium FL glass for enhanced bright views. The Victory Harpia Spotting Scopes are available in 85 mm or 95 mm sizes offering 22-65x or 23-70x magnification, respectively. Zeiss Conquest spotting scopes includes only the Gavia 85 angled 30-60x model. Main features include 10.8' close focus and a Manfrotto 200 PL compatible mount foot. 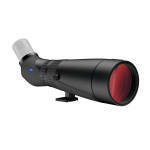 The Zeiss Dialyt Field Spotter 18-45x65 spotting scope is a roof prism scope featuring an 18-45x zoom eyepiece and a 65-mm objective lens. Used in handheld mode, the Dialyt Field Spotter gets you on your target quickly. Dialyt Field Spotters come with a carry strap that also facilitates using it in hand-held mode.